Good Friday afternoon all!!! Before I share my latest project with you, I have to thank you all so much for your prayers and continued support! Whilst I was away, nursing an ailing back. You have all been so kind, and it has done my heart and soul good to see how wonderful you all are. So thank you, again! Okay, now on with the task at hand! And, I'll just be honest with you (as if I could try to be anything else) I hate (okay hate is too strong of a word, greatly dislike with a passion) orange!! Always have. Yellow is a great second runner up for this dislike of mine. But, I do, However LOVE Fall, in all of its glorious radiance!! 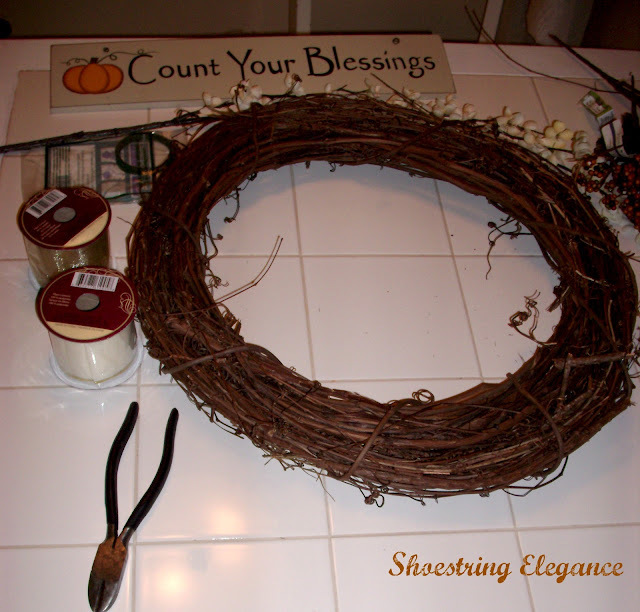 Normally this is not a big problem, but when starting to make a fall wreath to share with you all, I found it a little perplexing, but the best thing about sharing your work, is that you can share whatever your heart LOVE’s, and hope that there maybe people out there that feel the same!!! So here I go, again. Wait, before I go any further, for those of us who are economically challenged, I did this whole project for under $6.00!! Woohoo, you just have to love it when you can have something beautiful, that you've wanted and you can make it for so little!!! Okay, so to start with I picked up this very nice and tightly woven vine wreath @ Michael's on sale and an extra 50% off for 2.99!! It's the 18" one. The Fall blossoms were all the same discount deal(It was in the ad) Make sure when you are looking at all the different blooms available that you pick one with at least 3-4 branches or stems on it, I have found that the best way to get the bang for your buck! I got the ribbon and floral wire at the Dollar Tree for, come on, you guessed it $1 each. I had the wire cutters and the sign was a cute gift to me from a dear friend, who knows my taste!! So really, I spent 4.99 plus tax!! However, I have seen other little signs like this @ Ross or Marshall's for $2.99-3.99. So, there you have it!! Get a wreath to start with. Pick whatever flowers speak to your heart, cut them into workable pieces. 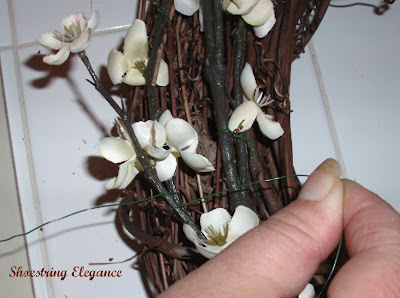 Use your floral wire to twine them onto your wreath, add any embellishments you like, make a bow and attach it! And there you go!! What great fun!! How nice it is to have up! Celebrating the seasons is always nice. I’ll probably take the flowers and bow off and change them out for my Christmas Wreath!! How awesome is that? And, Ahemm, thrifty!! Then the only the only cost for that will be on some new flowers and maybe some Red Ribbon!!! I hope you all are enjoying a Blessed weekend!! By the way my, house and the front door are being painted as I type, so as soon as it is completed, I'll come and share a picture with you of the Wreath actually on my front door!! 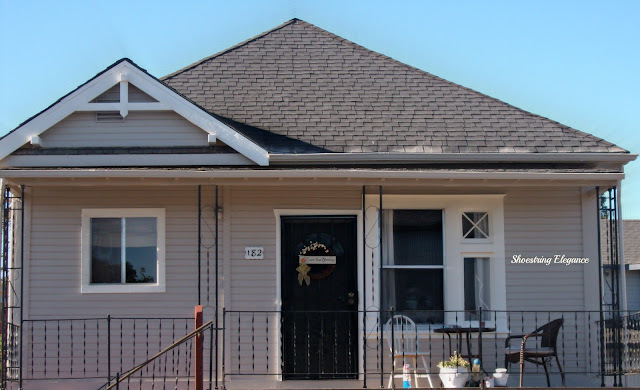 The house is finally done and is wearing her lovely new colors quite well for such an old thing!! 107 years old. I think she's looking pretty nice. Haven't got the front deck, stairs and rails yet, but I promised you an updated picture of this wreath in it's proper place so here she is!! I'm quite pleased with it in its new place and the new paint job!! I love your wreath very pretty for fall. You are so talented in more ways then one. Thanks, Marilyn! You are too kind! The wreath is lovely, much more to my taste than the orange,yellow, spooky ones! And, I am so very glad you are on the mend. Gentle hugs. Loving the gentle hugs and kind words! Thanks so much, Sandra! Found you on French Country Cottage and I like your wreath idea very much. Thanks so much for popping by!! It turned out super cute and I can't wait to see how you make one for the next Holiday ...... I'll keep an eye out for Christmas thing. Thanks so much, Miss Pamela! Love you and your very kind comments! Yeah, I'm kind of already thinking of how I'll be changing it, after Thanksgiving for the Holidays!! Hehe, it's an addiction. That wreath is beautiful! Thanks for joining the party! Very cute! I too am a 'thrifter' and love bargains, so I knew I'd love your blog! Thanks so much for your kind words and being my newest follower!! So glad to have you!! Welcome!! Thank you so much for sharing on Simple & Sweet Fridays. wow! wow! i love your wreath! i just loved your blog!! Thanks so much Betty!! I appreciate your kind comment, thanks for hopping over to check me out!! your wreath s lovely. Thank you for sharing at the Thursday Favorite Things hop. xo P.S. Have you entered my latest giveaway? It is very pretty and i like the price! Thanks so much for linking to what inspires me Friday. Another party is up if you want to join. Very pretty -- and the saying is just perfect. 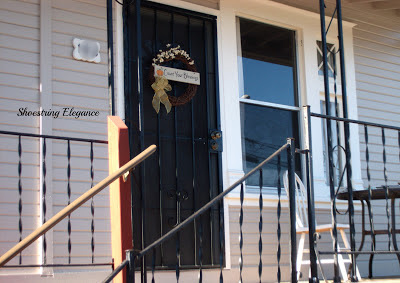 The wreath looks fabulous on the door of your newly painted house! Thanks so much for linking on Busy Monday! Thanks so much Charlene, I'm so glad you liked it!! Thanks for hosting your wonderful party, too!! Welcome as my newest blog follower! I'm so happy to "meet" you and look forward to getting to know you better! My Dearest Heather, Please forgive me I have no idea how I missed this!! sorry to say, too busy, health issues and then my computer down. 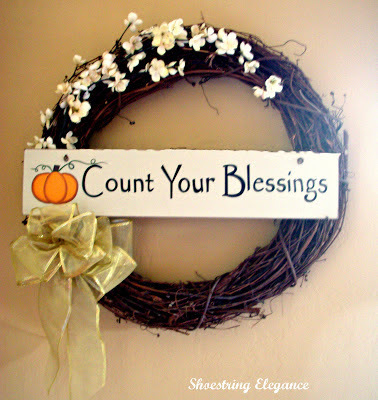 But, I am back and at it now and so appreciate you including my wreath on your round-up!!! Don't you just love Fall?! It was 95 here today and I can't wait for the cooler weather to begin! !